Neil Arnold interviews Rebecca and Mike about their ABC book, Australian Big Cats: An Unnatural History of Panthers. 1) Firstly, thanks for agreeing to the interview...the new book is fantastic and I must ask, in the book you put forward theories that the exotic cats in Australia may have been introduced by mascots or escaped from circuses, but one thing rarely mentioned in the book are exotic cats as pets. In the UK in the 1960s large cats were purchased in abundance, mainly as cubs. Was this situation not echoed in Australia or was the country not as swingin' in the '60s as it was here? No, chiefly due to our very restrictive quarantine laws. Although the country was "swinging" it was certainly not swinging with large exotic cats as pets. The over-riding fear has always been that anything exotic can escape and never be found in the bush here as the areas are just too dense and rough...and dangerous. 2) You have accumulated some startling evidence in the book; why do you think the authorities continue to ignore the evidence? Just standard lethargic public servants. I am not sure what it’s like in the UK, but if you cannot make it in the private sector here, you gravitate to the public sector.Most of the authorities here are completely clueless about any form of evidence; they change jobs all the time, go to a lot of meetings, send memos and basically cover their own arses.We have had staff from the NSW Department of Primary Industries asking us about DNA testing labs. We have sent the depts emails asking specific questions. Around one year later on average we will get an email that doesn’t answer the questions and segues into idiocy and false statements. We will correct all the points and return the email. Around 6 months later we will receive another email from someone else telling us that since our first email was answered the case is closed. One govt department's investigations into data manipulation involved them contacting the actual guy in the department whom we had complained about. They asked him if his department had done anything "dodgy" and he said no. End of the "investigation". After three emails you become a "vexatious complainant" and then your emails just go into some in box in Alaska. 3) If a child is attacked, and possibly killed by a large cat in Australia, what do you think will come of such an incident? At this stage of the "game", they would require a video of the attack or else they would pin the blame on dogs. Sarcasm aside, they don’t accept either secondary evidence, or primary evidence. They never investigated the lioness shot dead in the bush in western NSW in 1985 – the elusive and much sought after ‘body on the table’, so to speak. 4) You mentioned Golden Cats in the book, although these were rarely kept as pets, or in circuses, and yet there are hardly any mentions of lynx or bobcat in the book. Have there not been any reports of such animals? We were interested in the golden cat because of the crazy idea that some of these animals might have come across with early Indonesian traders who have been visiting the northern tips of Australia for possibly thousands of years. We were speculating that these animals could have crossed with early Felis catus lines – escapees from Dutch shipwrecks.The only ‘minor’ problem with those theories was the lack of evidence! We also speculated about hybrid vigour/adaption etc, which might have lead to larger animals and could explain the colour variations seen here. We have had reports of bobcat-type animals but they appear to be describing a short-tailed and muscular Felis catus. 5) Do you believe witnesses are definitely seeing jet-black cats, or simply not taking note of the rosette pattern which a melanistic leopard produces in its pelage ? Jet black for sure, but the lack of rosette reports has always been troubling. 6) There are mentions in the UK, Australia and US of black pumas, even though a melanistic puma would appear black dorsally and have a dirty cream/pale underside (melanistic pumas would not be uniformly black all over). Do you believe melanistic pumas exist in Australia or anywhere? We would love to believe that a melanistic form of puma exists as it would help us explain a lot of reports, but there is still zero evidence for their existence. 7) Do you believe animals could escape a zoo or circus and live in the wilds of Australia? I ask this because usually an animal kept in captivity would be tracked down and either shot or caught. Yes we do believe animals could easily live largely undetected in the wild here. You are right about the zoo or circus to a degree, but private collections would be another matter entirely. However, if an animal was released from a private collection or was lost/escaped, all the owners have to do is report that the animal has died and been buried/disposed of. No one from any department comes and physically checks that this is true – and that’s AFTER the laws were tightened. In our book we recount the recent example of a pygmy hippo that appeared to have been living quite well as an ‘escapee’ from a private collection in the Northern Territory. Pygmy hippos are not renowned for their stealth, so if a large water-loving mammal can live happily undetected in the Australian bush, why not an exotic cat? 8) It's interesting that in Australia there are some truly monstrous feral cats - how do you think these have come about ? Another unknown...we’re not sure why ‘just’ the environment here would force this issue. Why not elsewhere? Cats are incredibly adaptable predators that thrive in all kinds of conditions. Not many people realise that cats can survive for long periods without water, subsisting on the liquids (blood) they get from their prey. While Australia may seem quite an inhospitable environment for a cat, quite the opposite is true. We would love to see the nuclear DNA sequence one day to see if there is anything odd in the male line, such as a golden cat. 9) Do you think the overly large feral cats explain most black leopard sightings even though whatever its size, a feral cat doesn't resemble a black leopard. They could certainly explain some of them, especially at a distance when dealing with looking up or down a slope, but about three video sequences filmed in the last 20 years clearly show animals that do not conform to Felis catus morphology. The rest of the videos often show an animal that looks cheetah-like in shape, with a small head, often having pointed ears, which would seemingly rule out anything from the Panthera genus. 10) Have there been any reports of screaming cats, a noise which a puma would make? Yes, especially from Western Australia and central Victoria. However, just to muddy the waters further, these sounds are often heard on farms where black cats are being seen. 11) In the book there aren't many mentions of animals with cubs - do you receive many reports of animals with cubs? 12) How far do you think sightings go back in the history of Australia concerning large, exotic cats? Around the middle of the 1880s, which is roughly the time the first circus menageries started touring the country. 13) Do you believe inadequate research the world over is hindering the situation and relegating it to folklore ? Yes and no. Inadequate due to lack of time and money, for sure... The research needs more tangibles like DNA, primary and secondary evidence - like the recent successful hair and DNA analysis that identified Leopard hair from the Huddisford Woods in the UK. It’s unfortunate that too often many of these sightings become a part of folklore despite their basis in fact. 14) It seems highly unlikely in my opinion that Thylacoleo carnifex still roams the Australian bush. Do you believe it still exists and if not, what are people seeing? Yes, we agree that it is highly unlikely – it’s highly improbable. But having said that, it’s still possible. If it does not exist, then we cannot explain the large six-toed prints (and we are aware of polydactlyl Felis catus) or the witness descriptions of animals that have a box-like ‘possum’ head of the marsupial lion. Researcher Steve Temby filmed several sequences of animals in roughly one location over several months, and claims to have caught a Thylacoleo on film in one sequence. His footage was taken over several hundreds metres away from the animal with a normal low resolution video camera. 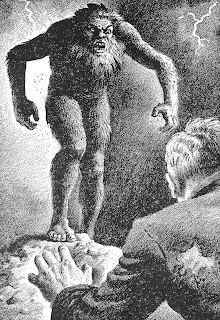 He was adamant that through his high-powered binoculars he could see that the animal had a huge boxy head, unusual prominent canines and thick, strange legs. Yet the video shows what looks like a large cat moving around. Steve Temby also stated the gait of the animal was very odd. If Thylacoleo is still roaming Australia, we cannot explain the lack of "modern" Aboriginal art, Aboriginal folklore or even early settlers’ reports. The whole thing is very messy and very strange. 15) Lions would often seek a pride and large prey. Do you believe witnesses genuinely report lions in Australia or are they mistaking a puma for a lioness? We have had very few lion-type reports (lion vocalisations come in sometimes). And yes, witnesses could confuse a puma for a lioness. Lions are a much more social animal and generally don’t care about being seen – a behaviour that proved costly for the Broken Hill lioness, which was spotted and shot by the side of the road. 16) Have you had any personal sightings of a large cat? I (Mike) watched an animal through a starlight scope that moved with the speed of a cheetah, with a similar body shape and the fluidity of a large cat. Rebecca observed a black fox moving across a paddock, which she initially thought might have been a cat. 17) What's been your most intriguing investigation? Probably the "Emmaville Panther", where we tracked down the skin of the animal shot by Charlie Leader, which we discuss in the book. We really thought we would crack that one with the DNA. The formaldehyde used to preserve the skin killed that Sherlock Holmes moment for us. 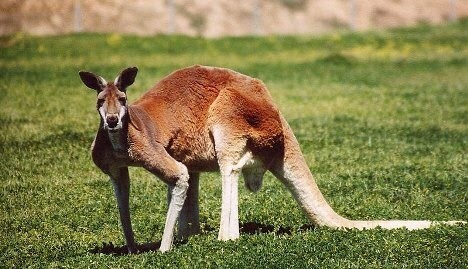 18) What other mystery animals roam Australia? There’s a steady stream of big cat, Thylacine and yowie reports always coming in. Bunyip reports have virtually dried up – it’s likely the animals responsible for these sightings were seals. 19) What are your opinions on the yowie? We think the odds of any ’undiscovered’ giant bipedal beast like the yowie/sasquatch/yeti sharing the same rough morphology and appearing on almost every continent a bit hard to fathom. We think it’s unlikely the ‘manimal’ is flesh-and-blood, but that’s largely based on the Australian experience. Just what it is we don’t know. 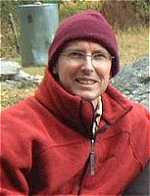 We have interviewed numerous witnesses, lived in a yowie ‘hot spot’ and written about the phenomena for Fortean Times. We find the whole subject very interesting. 20) I have on record a handful of stories pertaining to phantom black dogs, or hellhounds, from Australia. Do you believe these legends can also melt into the 'big cat' situation? 21) What other felidae are reported in Australia ? Other than what we have chatted about, there are very few reports that don’t fit into any of these pigeon holes. 22) Have hair samples, faeces etc, been analysed by authorities and proven to belong to an exotic cat? No, but then again they rarely if at all engage in such analysis. 23) For every genuine report you receive, how many crazy people contact you? For every 50 reports we will get one weirdo. We’ve been stalked, harassed on the telephone and been the victims of character assassination. It’s not easy being sane and interested in mystery animals. 24) Do you believe the thylacine still exists? 25) If authorities the world over admitted that large cats exist in places they shouldn't, what effect do you believe this will have on the eco-system, if such animals become a recognised species? I think the animals exist in places they should not and damage those eco-systems regardless whether authorities recognise this problem. If they are recognised here (I cannot talk for anywhere else) then nothing will change. The media would trumpet ‘Big cats exist!’ Everyone would say "I always knew it" and change the channel to sport. 26) If the authorities admit to such animals being out there, do you believe they'll have to attempt to exterminate every cat? Here? It would be impossible. Whatever the animals are, they do not go to trees if dogs chase them – in fact, the dogs are normally running the other way. The terrain is too thick and wild for tracking by humans and we do not have trained dogs here. Australian authorities simply don’t have the resources to deal with big cats – we lack general expertise. Add to that these cat-like animals don’t eat baits and don’t step into cages or traps and seem to have a canny sixth sense when it comes to infrared devices on cameras. 27) Do you know of anyone at the present who legally owns a large cat in Australia? 28) Any plans for another 'big cat' book, or possibly a book on other Australian mystery animals ? We’re presently working on re-issuing a big cat classic with a new foreword. We also have a few other mystery animal book ideas in the pipeline. 29) Do you believe that the witnesses who came forward in the book to say they'd been attacked by a large cat, were genuine ? Genuine, yes; attacked by a big cat, no. They just don’t have the kind of injuries meted out by large exotic cats. Swipes from leopards, lions, tigers, jaguars and the like would leave the injured party with shredded flesh hanging from their arms, not superficial cuts and bruises. 30) What does the future hold for the 'big cats' in Australia? 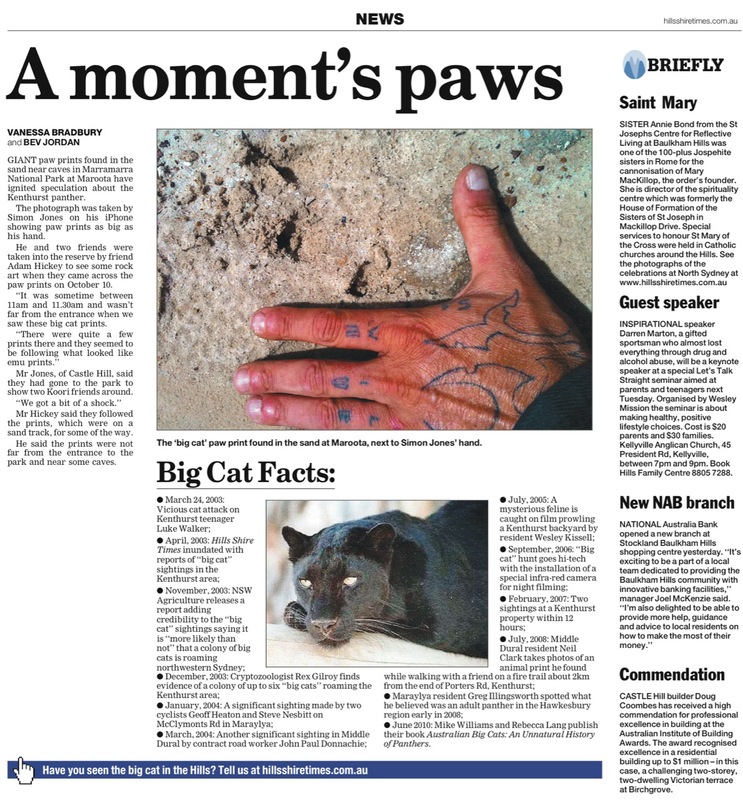 Hopefully a body on the table – indisputable proof of the big cat in Australia. Thanks for taking the time to write these questions and for the ripper review! We received an email today from Hollywood actor Harrison Ford - truly! After we got over the shock, we realised we weren't the only ones - yeah, it was a mass mail-out to Conservation International members and supporters. But that's OK. There's a petition to be signed ahead of the Global Convention on Biological Diversity in Nagoya, Japan NEXT WEEK, to lobby the world's leaders to support a call to protect 25% of the earth's land and inland waters, and 15% of marine ecosystems by 2020. By preserving the many fragile habitats endangered species that call them home have a fighting chance. Ford, who besides being a legendary actor and a dab hand with the light sabre, is CI's vic chairman of the board, is rallying everyone to the cause. Check it out. And sign the petition here. Yowie, big cat or a collage of curious beast tracks - what could have left behind these mysterious prints? That's what the good folk of the Upper MacLeay are asking after a local farmer found and preserved some weird tracks he spotted on the banks of a river. 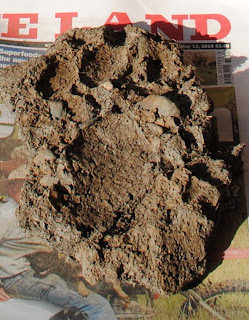 Toorooka resident Reg Wooderson found the footprint last month while working on his tractor. “We had a big rise in the river and a lot of debris got washed down after a couple of day’s rain,” Mr Wooderson said. Remarkably lying on top of the rubble was a set of large footprints. Dedicated to helping sick, injured and orphaned animals, the Australian Wildlife Hospital is the largest of its kind in the world. 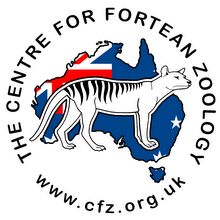 Located in Queensland, it's an establishment where every single creature counts - hence their motto 'save one, save the species'. On 31st of October the CFZ 2010 expedition leaves England. They will be exploring the Garo Hills in Northern India in search of the mande-burung or Indian yeti. The five-man team consists of team leader Adam Davies, Dr Chris Clark, Dave Archer, field naturalist John McGowan, and cryptozoologist Richard Freeman. And the lads now have a blog! Check in regularly and see how they progress. The debate surrounding the possible existence of the cunning and elusive Tasmanian fox (Vulpes vuples) has once again reared its head after a fox was reportedly spotted near the state's capital, Hobart, this week. Farmer Bob Judd saw what he believes was a fox on his property this week. "I grew up on a farm in South Australia and I know exactly what a fox looks like," he said. "There was this red apparition running like lightning, grease lightning, up the hill and it was a fox - it had a red bushy tail and all the rest of it." Officers from the Fox Eradication Program have taken detection dogs down to the property to locate the animal. The Manager of the Fox Eradication Program Alan Johnston, says more than 2,000 fox sightings have been reported since 2002. 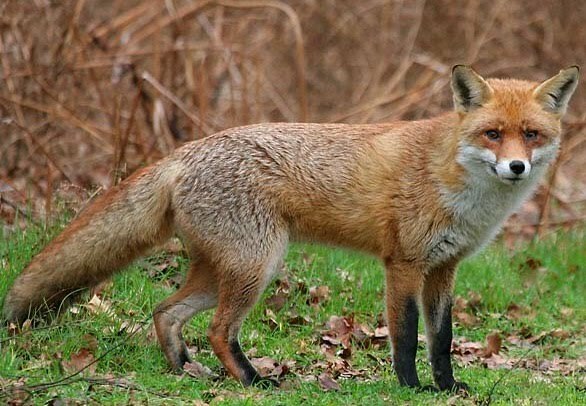 Foxes were introduced to Australia in the 1850s by English settlers, but Tasmania remained fox-free until the 1990s when evidence of their presence began turning up. The fox has inflicted enormous impacts on the native wildlife of Australia, being implicated in the extinction of many native animals. Tasmanians can report fox sightings and any other evidence (unusual scats, den sites, stock kills) to the FOX HOTLINE 1300 FOX OUT (1300 369 688). Thirty years after the disappearance of baby Azaria Chamberlain, whose parents always claimed she was taken by a dingo, Australia is preparing a new inquest to try to resolve the question. Azaria's mother, Lindy, was found guilty of murder in 1982. But she was later exonerated after a piece of the baby's clothing was found in an area full of dingo lairs. The inquest will examine the question of whether the baby was taken by a dingo. 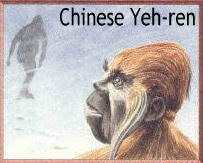 Beijing, China (AHN) - Despite more than 400 people claiming to have sighted an elusive ape-like creature covered all over with red, gray or black hair, lurking in the mountainous region of Shennongjia Nature Reserve, Heibei China, it has never been found. Past expeditions have only brought back hairs supposedly from the creature, which when analyzed were neither of human or any known animal species. If found, this “missing link” would help scientists learn how primates evolved from ape to human. Richard Freeman: Return to Sumatra - On the Trail of the Orang Pendek. Mike Hallowell: The South Shields Poltergeist. Thylacines and big cats still lurk in the South West forests, according to Alan Troode of Nannup. He collects and collates stories of both big cat and “Nannup tiger” (thylacine) sightings, concentrating on reports from around Nannup . Alan first became interested in the thylacine when reading newspaper articles published in the early 1980s. He was intrigued by the thought that the South West forests might harbour such fabulous animals and his interest was reignited when he moved to Nannup in the late 1990s. Work and family commitments allowed him limited time to pursue the stories but conversations with locals fortified his interest. He quickly came to the conclusion that he was not only looking at stories and descriptions of the Thylacine but also large predatory cats, not wild feral domestic cats but an animal the size of the mountain lion, cougar or puma , Felis Concolor . He reckons he has an unbiased point of view when taking down thylacine stories and he soon realised that anything that moved in the bush that was not easily identified was claimed to be the Nannup tiger. Some incidents contributing to the Nannup tiger legend showed traits and characteristics that Alan can only describe as speculative. Still he came to the conclusion that both the thylacine and Felis Concolor — two distinct predatory animals — roam the South West. Two distinct animals give rise to two distinct animal hunters, he said. 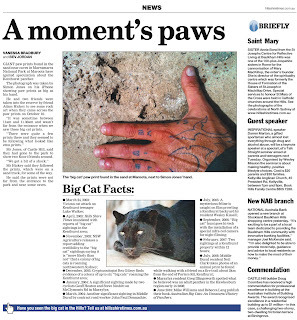 Information about both animals has been diverse, controversial and stories have been at odds with each other at times. 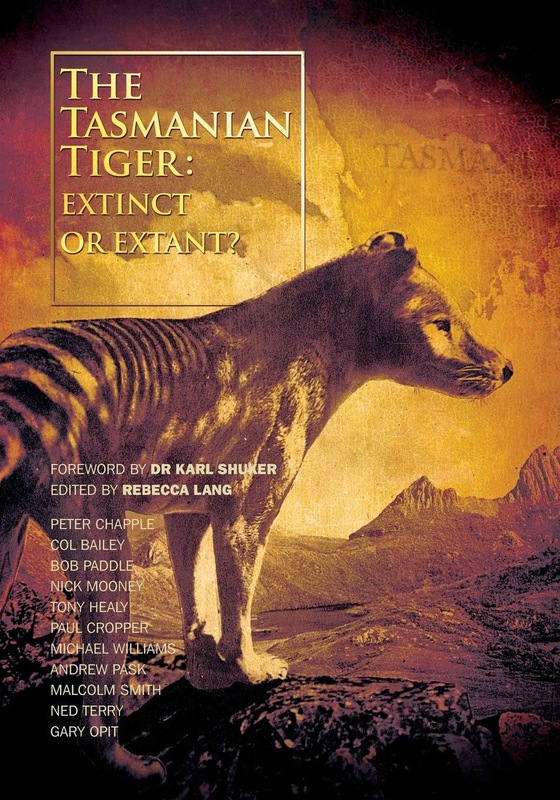 There is very little information about the thylacine and some reported characteristics cloud the issue further. Reports have the tiger ranging in colour from light yellow to fawn, light brown to dark biscuit and all black — and with or without stripes. Vocalisations have been described as hissing, coughing, snarling, growling and snapping. During mating the mysterious beast is said to have a blood-curdling scream. Often caught in car headlights at night, the blue eyes are believed to be the black tiger and the amber eyes belonging to the yellow chocolate tiger, he said. Habits such as scratching sticks and dirt over carcases, multiple kills and the size of some animals killed brings into question the weight to kill ratio. On some occasions the animal is described as being rather inquisitive and in no hurry to move and other reports have the animal taking flight and gone in a flash. All this conflicting information has led Alan to believe that both the thylacine and Felis Concolor are still at large in the South West. “I am only starting to scratch the tip of the iceberg so to speak and have a lot of further work to do on correlating both types of sightings,” he said. “There are sightings of both animals in many areas claiming both tiger and cat occurrences. Alan believes this can only help to strengthen belief in the presence of both the big cat and the Nannup tiger. In 2009, scientists went on two expeditions into the “lost land” of Papua New Guinea, and gathered up more than 200 new species. The new species, including a bat that bears more than a passing resemblance to the Star Wars character Yoda, were unveiled today for the first time by the American group, Conservation International. An Out of Place Animal (OOPA) a long way from home met an unfortunate end at the hands of a startled German driver this week. A 53-year-old driver in the Lower Saxony town of Haren was startled when the kangaroo bounced into the path of his car on Wednesday. Despite slamming on his brakes, he hit and injured the animal. With the help of a local resident, the man captured the kangaroo and took it to the nearby Nordhorn zoo. Vets at the zoo established that the animal had a serious leg fracture they were unable to mend. They therefore put the animal down. Police announced on Thursday that it was still unclear where the iconic Australian animal had come from. “So far, no kangaroo from a zoo or animal park has been reported as missing,” a police spokesman said. AWARD winning Australian geneticist and occasional Queensland Parks and Wildlife Service consultant Alan Wilton has joined criticism of Queensland Government dingo management practices on Fraser Island. Dr Wilton’s research for the University of New South Wales proved dingoes are in danger of dying out through interbreeding in most other parts of Australia, something he says makes the pure strain on Fraser Island more significant. He said pure strains on the east of the continent probably only exist on Fraser Island and in the Snowy Mountains. Speaking at a recent fundraising dinner for the conservation group, Save Fraser Island Dingoes (SFID), Dr Wilton formally accepted the group’s invitation to become its patron and said the point of World Heritage listing is lost if island management does not protect wildlife there. “The whole idea of having heritage areas is to preserve the species in those areas and that should be the priority,” he said. 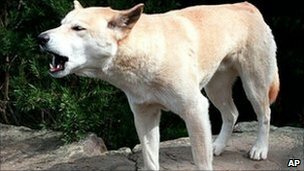 He claims the mating of siblings among the island dingoes is a sign of a species in dire stress and close to extinction. 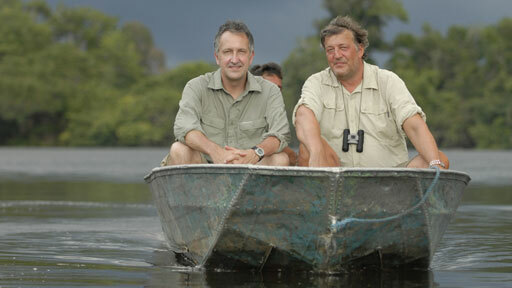 He was supported by former QPWS ranger Ray Revill, who now runs a private wildlife sanctuary at Maryborough. Mr Revill says dingo issues did not exist in his time on the island, throughout much of the 1980s. He said the four dingo feeding stations then on the island worked well and there was never any aggression from any of the animals. Other speakers listed a range of other species which are now thought to have disappeared from the island. SFID president Malcolm Kilpatrick said the organisation’s major funding priority at the moment is to support Rainbow Beach wildlife photographer Jennifer Parkhurst, who is due to appear in court again in November on a list of charges alleging feeding and interacting with dingoes on the island.